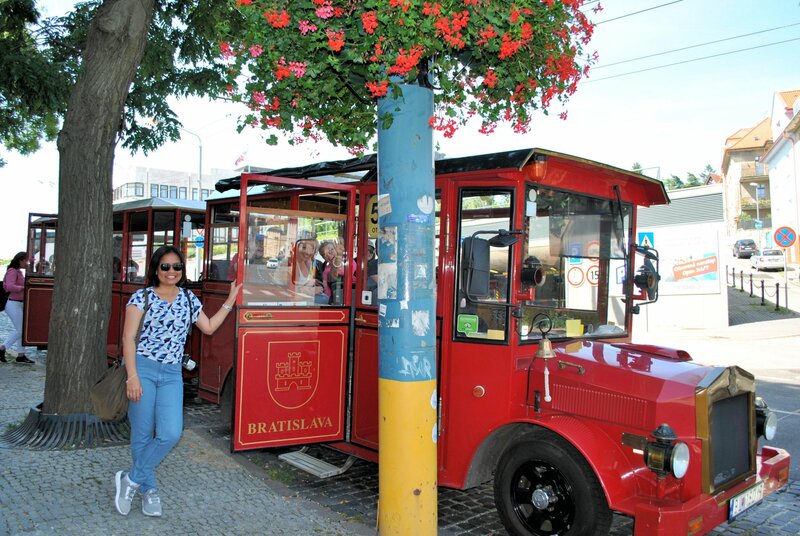 Slovakia’s capital – Bratislava was one of our comfort stop during our Taste of Eastern Europe trip. On our way to Prague, we were given a couple of hours to explore Bratislava. 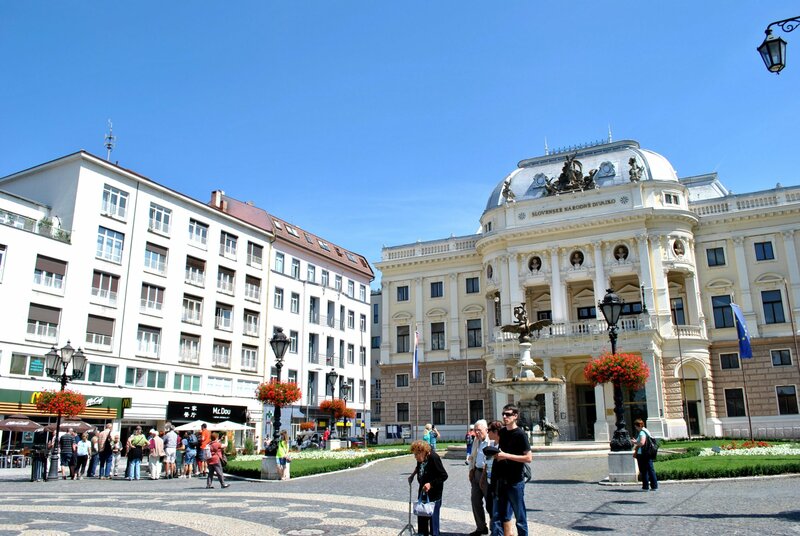 The city is relatively small and a half day tour is very doable especially if you are coming from Vienna or Budapest. 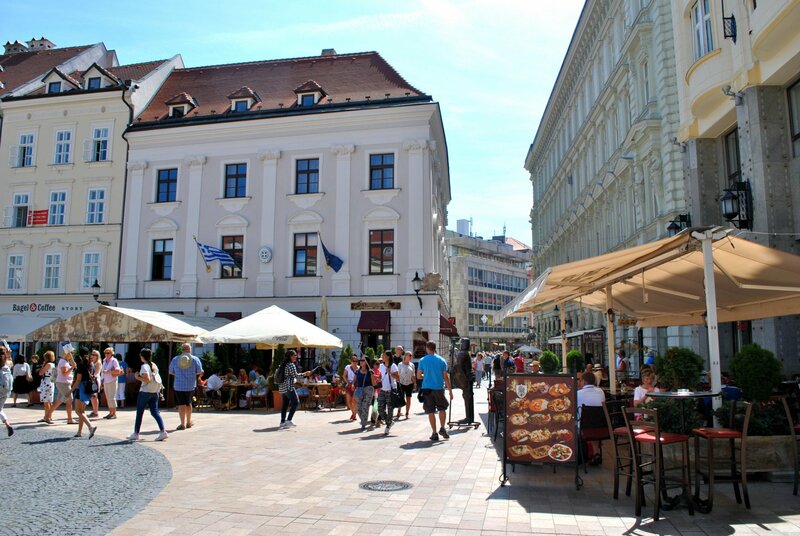 The 18th century historic city is known for its quaint and winding cobblestone pedestrian streets. 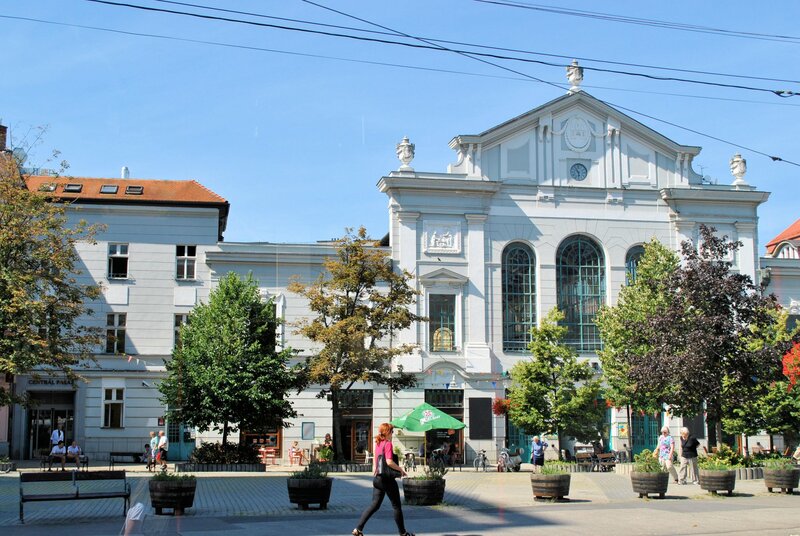 It has a vibrant atmosphere that invites everyone to enjoy the fascinating sites of the Old Town. The main square boast traditional restaurants, cafe’s and shops. Upon our arrival in the city, our Oldtimer vehicle was already waiting for us. The vintage looking car train is equipped with an audio-guide where you can listen in several languages as you tour around the city. 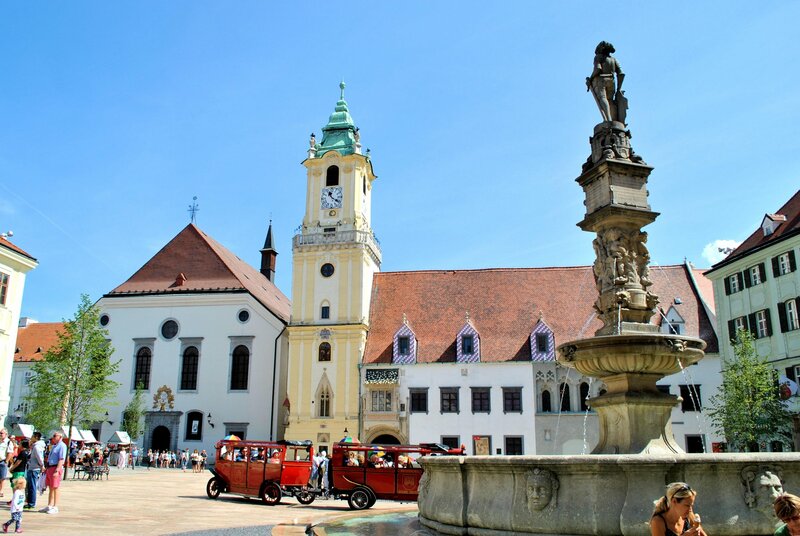 The ride was about half an hour tour and it will take you to a number of fascinating sites like the Old Town Hall and Main Square where the oldest fountain in the city can be found. 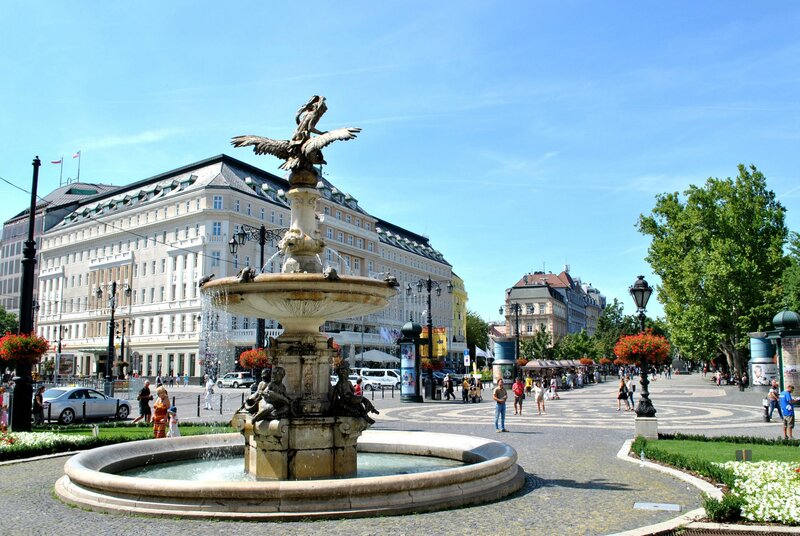 Among the other interesting sites are the St. Martin’s Cathedral – the coronation Cathedral of Hungarian Kings, ancient St. Clare’s Church, St. Michael’s Gate, the executioner’s house, palaces from the time of Empress Maria Theresa, and the Plague Pillar, City Statues. 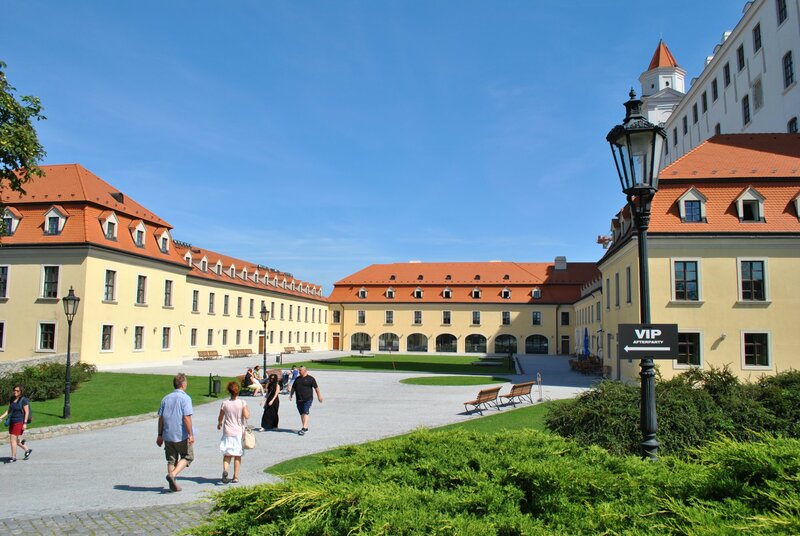 Bratislava Castle sits on a hilltop overlooking the Danube river. 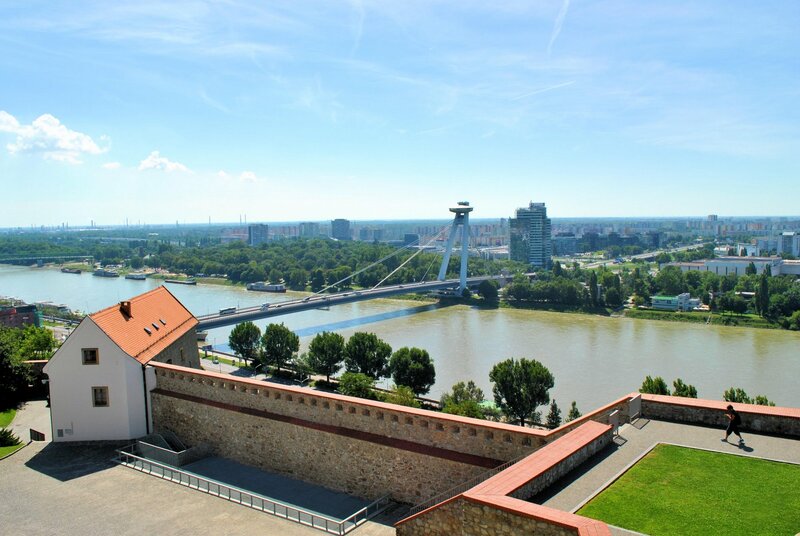 This iconic castle dominates the city and offer spectacular views of Bratislava. The Most SNP or commonly known as UFO Bridge is one of the exciting views from the castle. Actually the flying-saucer shaped structure is a restaurant and is a special attraction in the city since 2005. One of the Old Town’s busy street lined with pastel colored buildings and restaurants and the St. Michael Tower at the backdrop. There are many statues scattered around the old town and if you’re lucky you can spot them all. Actually, we saw some of them unfortunately we didn’t get a chance to capture a snap of the other statues due to many tourists who wanted to take photos with them. 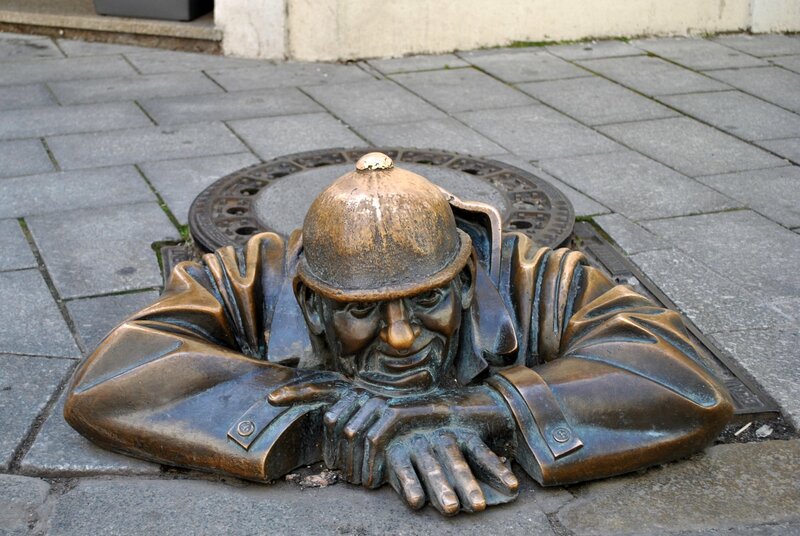 You can’t say you’ve been to Bratislava if you didn’t find this guy. The Cumil or otherwise know as the ‘Watcher’ is the most photographed statue in the old town. 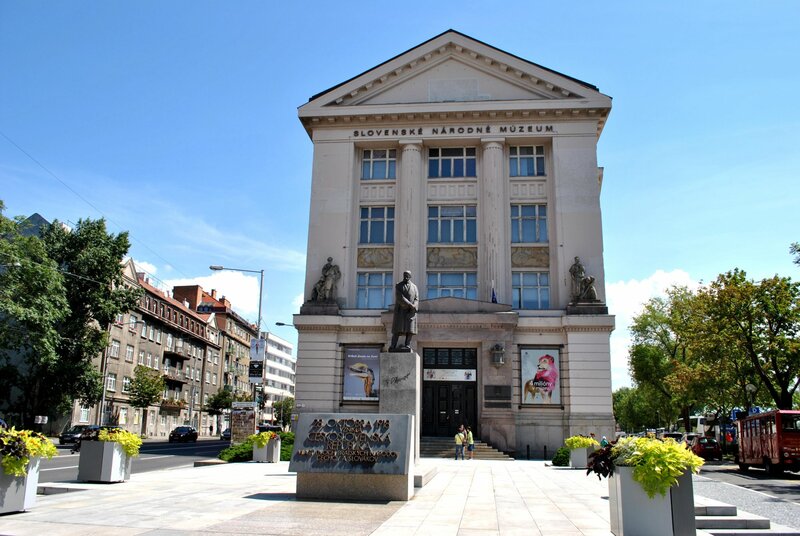 You can find him at the junction of Laurinská and Panská Streets. Schone Naci is a silver statue of a real person named Ignac Lamar. There’s no way you’ll get starve while exploring the Old Town. 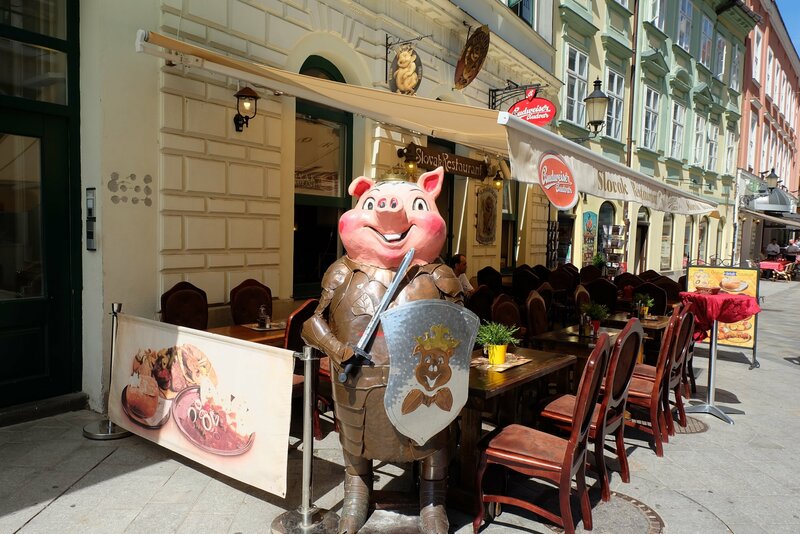 The abundance of restaurants, cafe’s and bars will surely entice you to try some of the traditional Slovakian food. Bryndzove halushky – potato dumplings with sheep cheese (bryndza) and roasted bacon. Zemiakové placky – potato pancakes fried in oil with garlic and flour. Granadír – pasta with potato. Fried cheese – cheese fried in bread crumbs. That’s how our quick stop in Bratislava unfolded. It was short but Derick and I were glad to have the opportunity to see the well-preserved Medieval city center of Bratislava. I need to go visit ASAP! Wow. Looks charming and not so crowded at all! I can’t possibly see everything so I enjoy looking at the photos and reading about different places. My wife and I are planning a trip to Austria and were hoping to get in a side trip to Bratislava. The funky little but looks like a wonderful way to see the town. We might have to search out some of those statues in Old Town while we are there too. Amazing pics! 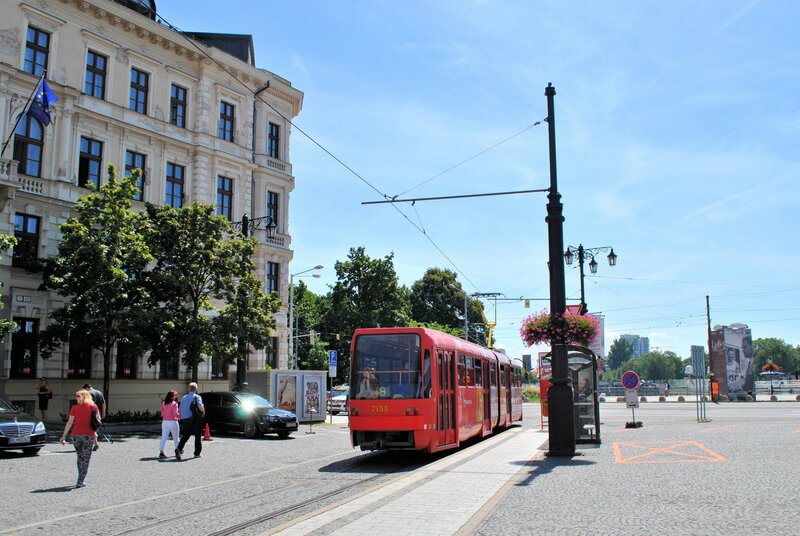 I love the way Bratislava looks! Reminds me of a fairy tale! I would so visit for the potato dishes alone! Tfs! This is such a pretty European city, your pictures are so lovely, I wanna go!! Love the Cumin! What a great compilation, you make me want to visit! I love how almost all European cities have an Old Town, yet all so unique. Slovakia is a country I didn’t know much about but love all the vibrant colors and charm. This looks like such a lovely place to visit. I love how quaint it is, and the mix of modern and historic! 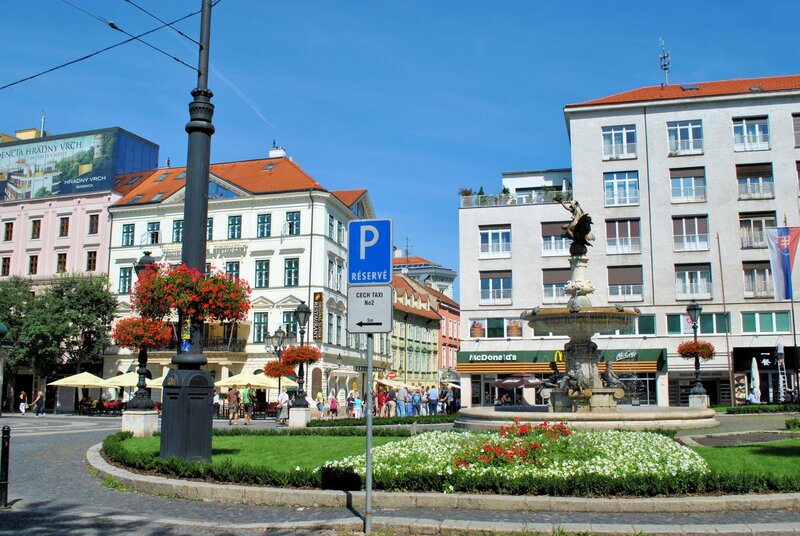 I have been to Slovakia only once and for the evening and morning only so couldnt enjoy the city to the fullest. I just went to the castle, old town and some local cafes. Seems like the tour you have done is intense and lots of things to see! 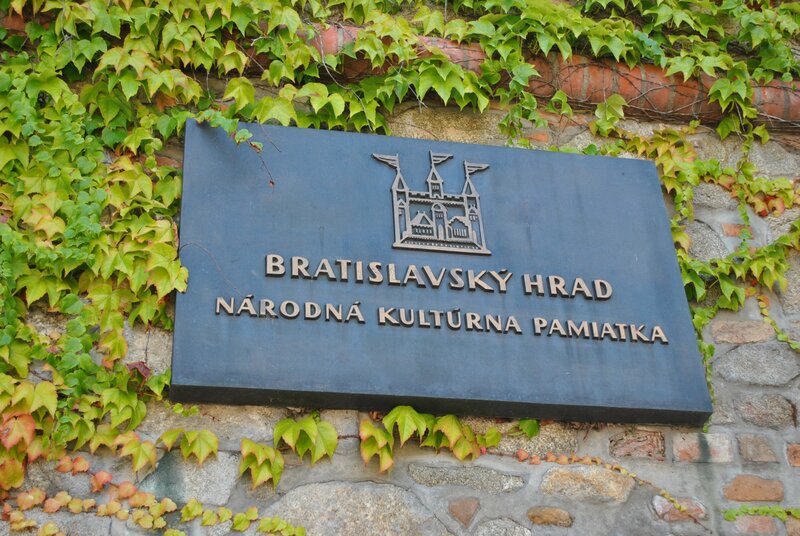 I love exploring the old historic cities and looks like Bratislava has so many amazing things to explore! It reminds of St. Augustine, the oldest city in the United States! Simply beautiful! 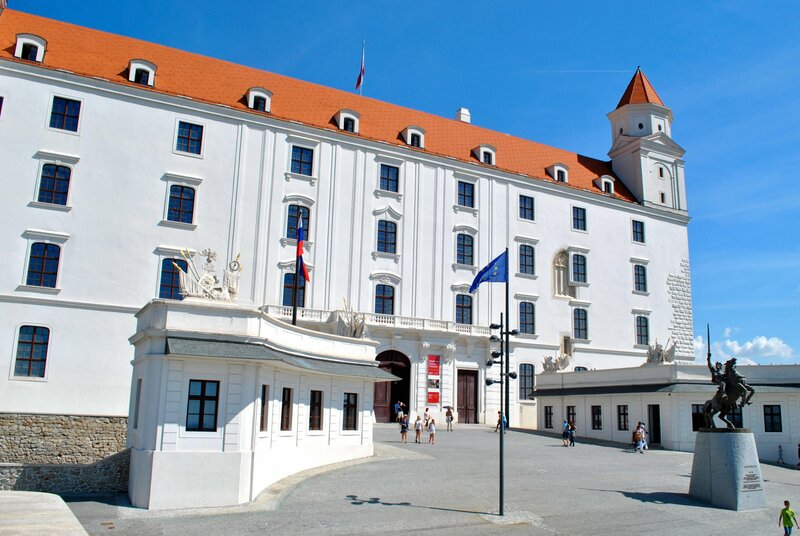 The Bratislava Castle looks so grand. It’s been a dream of mine to visit castles considering that I regularly play Dungeons and Dragons when I was still in college. It’s amazing how many interesting cities there are in Eastern Europe. Bratislava looks beautiful! I love castles so I’d definitely like to visit the castle. And of course, I’d want to get a snap with The Watcher statue. The oldtimer vehicle is just so cute! I’d defintely stroll around the Old Town. That’s always my kinda thing to do. The traditional Slovakian food you’ve listed is all veggie and that makes me so happy! The castle kind of looks like a mini Versaille or is that just me haha? Looks like you packed a lot into a small amount of time which is what I love to do!! I have been hearing a lot of wonderful things about Slovakia lately! Those statues in the old town are so cute. And you say they are all over. It would be fun spotting them. Love the whole vibe of this city. The Oldtimer vehicle looks impressive it must be a fun experience exploring the city riding it. 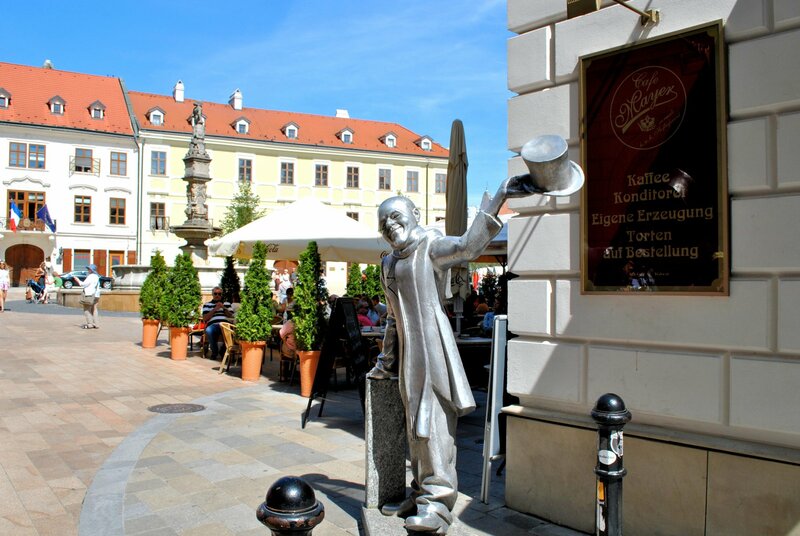 Bratislava has been on the list for a while and we would definitely look out for those statues and not miss tasting the local cuisine too. Thanks for these tips. Such a cute and clean city. That old-fashioned train with audio guide looks amazing and so is the castle. The views from the saucer-shaped restaurant will be too good. And the watcher sculpture is a worth click for sure. I Loved all your pictures. “The watcher” is cute but kinda creepy too haha! I literally googled where Slovakia is on the map. Hehe! I thought it was somewhere far east katabi ng Ukraine, malapit lang pala sa Austria and Hungary! The city looks quiet and relaxing unlike the other busy cities like Prague. Ang ganda rin ng weather! Did you guys do this as a day trip? Bratislava looks so charming and your photos are beautiful as always. We are planning to have an Eastern Europe tour in the future and include it 😉 but maybe 2-3 years pa. haha. I’d love to have also your support and follow back as you can count on mine.